To keep your lizard happy, you need to give them a home as similar to their natural habitat as possible. Sand makes a great substrate, and it will hold and conduct heat from under cage heating pads extremely well. Sand, though, is very difficult to keep clean. Bits of bearded dragon food and feces are near impossible to separate from the clean sand. Unless you have a cheap, readily available, source of clean sand; another floor substrate is probably for the best. 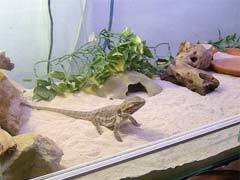 Most people that keep bearded dragons as pets use AstroTurf, rocks, or even plain indoor outdoor carpet. These are easy to clean and comfortable for most reptiles. Bearded dragons, like all reptiles, need heat. You can achieve a comfortable temperature for bearded dragon cages by using heating pads designed to sit under the cage and warm the entire floor. Heat rocks are also a necessity, this will keep their belly nice and warm while they bask in another cage necessity; heat lamps. To monitor all these heating devices, a temperature and humidity gauge should be placed in the cage for easy reference. These are commonly sold in combo units at many pet stores. A water bowl large enough for bathing and a place to hide, such as a tunnel, are also important additions. Keep the water bowl full to aid in raising the humidity in the cage. Extras will depend on your bearded dragon cages sizes. Plants can also help raise humidity; just make sure to thoroughly clean them first. Bearded dragon cages also do well with plenty of structures like rocks scattered about for climbing. Make sure to give your dragon everything he needs and plenty of what he wants.